Exciting developments on the HOME STAR front with bills being drafted in both the U.S. House and Senate. GreenHomes America is proud to be supporting these efforts with input based on our real-world experience delivering improvements to homeowners in New York, New Jersey, and California, improvements that not only help them stop wasting money and energy, but more them more comfortable in their homes. In Washington DC, the HOME STAR Coalition today applauded Chairman Jeff Bingaman (D-NM), Ranking Member Lisa Murkowski (R-AK) and members of the Senate Committee on Energy and Natural Resources for holding a hearing on the need for bi-partisan, job-creating legislation such as the proposed HOME STAR legislation. “I’m honored to have the opportunity to testify before the Senate to voice support for the Home Star program on behalf of the entire HOME STAR Coalition. HOME STAR is a win-win-win as it will put our nation’s skilled construction force back to work, benefit homeowners through comfort and energy efficient improvements to their existing homes, and result in long term energy efficiency gains. On behalf of the entire Home Star Coalition, I urge Congress to act quickly to commence this program,” said WellHome President Larry Laseter in his remarks before the Senate Committee. HOME STAR is a market-driven, low-bureaucracy program that would create jobs fast by scaling the existing home energy efficiency improvement industry. HOME STAR would use incentives to spur more Americans to start making their homes more energy efficient. It would establish a $6 billion rebate program to encourage immediate investment in energy-efficient appliances, building mechanical systems and insulation, and whole-home energy efficiency retrofits. Consumers nationwide would embrace HOME STAR because it will be imple, accessible and help them save money. “Home Star is an essential step to help Americans save on their energy bills while spurring the creation of good jobs and new industries that drive economic recovery and help our country achieve energy independence,” said Chris Chafe, Executive Director of Change to Win. HOME STAR would help to kick-start the comeback of our country’s hard-hit construction industry. It’s estimated the legislation would create 168,000 new jobs in construction and related industries over the next two years. This would have a big impact because one out of four construction workers is currently out of a job. President Obama highlighted HOME STAR’s ability to create jobs for construction workers and contractors during a speech on March 2 while visiting Savannah Technical College in Georgia. “HOME STAR is the right investment for the country at the right time. Energy efficiency is not a partisan issue, as it helps move us toward greater energy independence and enhances our national security. This program is targeted at the largest marketplace in the country, existing homes, and will be create jobs in a new industry that will thrive for decades,” said Tracy Price, CEO of The Linc Group. The HOME STAR Coalition represents over 500 construction contractors, building products and mechanical manufacturers, retail sales businesses, environmental and energy efficiency groups and labor advocates from all 50 states who want to see the job creation and energy savings benefits of federal HOME STAR legislation realized. A draft of the proposed legislation is on the Senate Energy Committee website. Home energy audits are valuable to determine how your home is performing and where it needs attention. A good audit includes a blower door test and other diagnotics. With a lot of interest in the ice forming on people’s roofs in recent weeks, we’ve gotten a few comments, here and offline, encouraging people to look beyond the attics. And that’s absolutely right! While an ice damming problem may be like a gaping wound that needs immediate attention, it’s important to remember that just because you got stitches last year does mean you shouldn’t get a full physical, too. And for your home, the equivalent to a physical is a home energy audit. And in the interest of recycling, I’m going to recycle much of a previous post on the subject. Full a fuller description and details to watch for, I encourage you to visit the overview on our website, or check out this energy audit video. Regarding the audit it’s important to get the right audit–accurate and actionable. To be accurate, the audit needs to include a good inspection and a range of diagnostics including combustion safety, infiltration (using a blower door), duct leakage testing, and an infrared scan. If the person conducting the audit is making cost-effectiveness recommendations, then they need to have a firm understanding of local installation costs by a quality contractor—if they don’t know these exact prices they can’t talk about cost effectiveness! To be actionable, any recommendations for improvement need to be easily understood by you and easily communicated to an installation contractor who can fully execute the recommendations. For example, if the recommendations are for attic air-sealing and insulation (you shouldn’t do the insulation without the air-sealing), the person doing the work needs to understand exactly what needs to be done and be able to deliver (assuming the recommendations are accurate—see above!). A simple “clipboard audit” or home energy rating won’t cover both of these for you, so make sure you get what you need! And don’t waste your money on what you don’t! For a bit more background and additional links, see my earlier posts, our website, including a video description. Team Germany won DOE’s solar decatholon again, largely on the shoulders of the points it scored for generated surplus energy. Right behind in second place was the University of Illinois-Champaign Urbana (oskee wow wow, my alma mater) with a more more traditional looking home. The simple and elegant U of I design showed that home can look like what we’re all used to–not something out of the Jetsons–and still be incredibly energy-efficient and even net energy producers. You can build homes that ooze comfort just like Grandma’s home but that can be heated, cooled, and power for next to nothing. Actually, this is no surprise on the new construction side. We’ve been able to do that for years. It’s generally more difficult to get to net-zero in existing homes. But there is a lot that can be done to make existing homes much more comfortable and use less than half the energy they’re using now. It ain’t rocket science–but it is building science, and you’ve got to choose wisely to get there. Now that summer is officially here, let’s get to those cooling tips I promised earlier. Some of the tips are simple things you can do yourself. Some are more involved are likely are best handled by a contractor. Keep the heat out! During the day, if it’s cooler inside than outside, keep windows shut. And keep window shades down to block out direct sunlight. Open the windows at night if it’s cooler outside than in. Solar shades can help. And the more ambitious project, new low-e windows with a low “solar heat gain coefficient” (SHGC) can block the heat from the sun. Ceiling fans (and other fans) help you stay comfortable—but only while you’re in the room. The fan motors actually generate heat, so turn them off when you’re not there. Use a bath fan vented to the outside to remove the heat and moisture created by showering. If you don’t have a bath fan, install one. Similarly, use a kitchen exhaust fan to remove heat and moisture created by cooking. This has the added benefit of removing pollutants, especially if you cook with gas. Use efficient lighting and appliances. Incandescent and halogen lights actually use most of their energy creating heat instead of light. Not only does this means you’re overpaying for lighting, but in the summer you’re creating a lot of unwanted heat in the rooms you’re trying to keep cool. Compact florescent light bulbs have improved greatly over the past several years. The humming, slow starts, and ghoulish colors of years past are gone. With lighting or appliances, look for ENERGY STAR models. Do you have a forced air heating or cooling system? If so, make sure to seal and insulate the ductwork in attics and crawl spaces. As much as 30% of the air you cool can escape outside through leaky ducts. Planting deciduous trees on the south and west sides of a house can help keep your home cool in the summer. In many parts of the country, maples, oaks, and birches are good trees to consider. Because they drop their leaves in the fall, they let sunlight through to help warm your house in the winter. To really find the trouble spots in your home, and to be sure that they’re addressed properly, get a comprehensive home assessment like those recommended in the Home Performance with ENERGY STAR program. 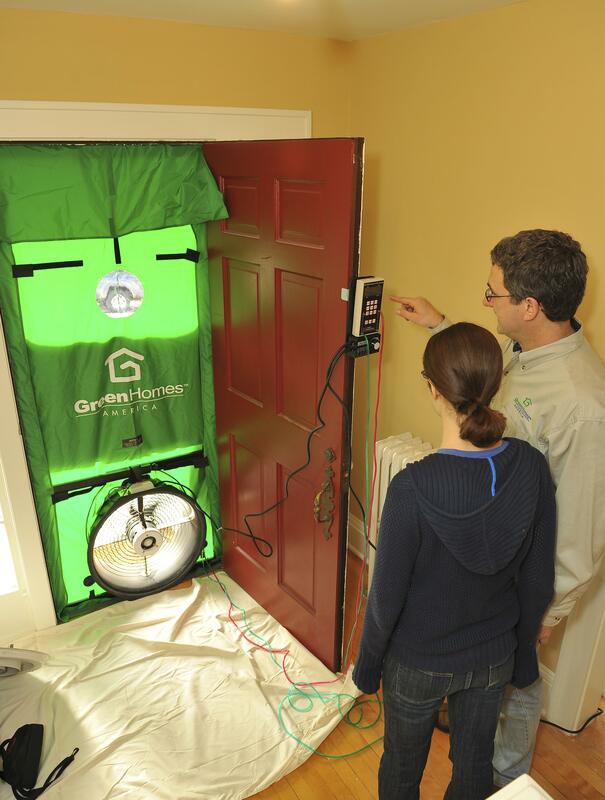 GreenHomes America can provide this, and GreenHomes trained and certified crews can even install your improvements. And whether you do the work yourself or you have it done by a contractor, after you tighten the house you should have any combustion equipment like furnaces and water heaters tested to make sure they’re running safely and efficiently. GreenHomes does this testing on every project it completes. Here’s one to start some debate. “Green” means a lot of different things to different people. At the heart of it though, green is about helping protect the environment so that we, and our children, have a healthy, safe, and comfortable place to live. When we talk about green buildings, we mean buildings that are healthy, durable, and energy efficient. The greenest thing you can do with your home is to make sure it performs as efficiently as possible so that it keeps you healthier, safer, and more comfortable without wasting energy and creating unnecessary pollution. This is before you think about bamboo, recycled tiles, or organic drapes. Get a home energy assessment and use its recommendations to reduce energy use by at least 25% and as much as 50% or more. The assessment won’t save you anything by itself, but it will identify the right steps, and installing the recommended measures can save you big! Insulate your walls and ceilings (save 2,000 lbs of carbon dioxide and $245 a year). Remember, that like a loose fleece in the wind without a shell jacket (or wind blocking membrane) that insulation doesn’t work well without air-sealing. So make your home a “green home.” It will last longer, cost less to operate and maintain, and as an added benefit, you’ll be more comfortable, too!